Esther Clayson was born in Seabeck, Washington Territory November 16, 1869. In 1894 she graduated as the second woman to graduate from the University of Oregon Medical School and the first woman to practice. In 1898 she followed her husband, Dr. Emil Pohl, to Alaska for the gold rush. Emil died of encephalitis in 1909. Her brother Fred was murdered on the Dawson trail and she lost her only child Frederick at the age of eight to an ulcer of the bowel. Despite these difficulties she practiced medicine in Portland where she became the first female to hold the post of chairman of the Health Department (1907- 1909) in a city of that size. She installed the city’s first school nurse, wrote its first milk ordinance and demanded sweeping reforms in food handling. She was an outspoken advocate for women and joined women’s suffrage groups and eventually ran as representative to Congress. When she left the health department she became head of the department of obstetrics and gynecology in the Portland medical group of Coffey, Sears, Jones and Joyce. During this period she married Portland businessman George Lovejoy. Dr. Lovejoy served during World War I with the American Red Cross and in 1919 became the president of the American Women’s Hospital Service. In this capacity she traveled widely to alleviate suffering from war, disaster, famine, revolution and poverty. She organized the relief services of the AWHS throughout the Near East and especially in Greece. A bust of Dr. Lovejoy stands in the town square of Nikea, Piraeus, Greece. 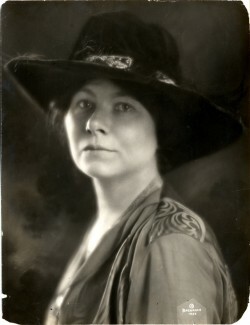 Esther also was the first president of the Medical Women’s International Association of which she helped to found in 1919. A mural with a portrait of Dr. Lovejoy is displayed in the Esther Pohl Lovejoy Hall at the Philippine Medical Women’s Association building in Manila. In 1938 she finished, Women Physicians and Surgeons, a monumental task completed by researching archives and searching in attics all over the world. Twenty years later she published Women Doctors of the World. Her next book, Certain Samaritans, documented the complex work of the AWHS. She lived without extravagance and worked endless hours. In 1963, four years before her death she traveled to Alaska, Tokyo, Hong Kong and Manila. She revisited the University of Oregon Medical School where she had established the Pohl Memorial Scholarship Funded in memory of her first husband and son, saying that she was glad to have had “the chance to remind the trustees that one third of the scholarships should go to girls”. Esther Pohl Lovejoy died at 97 years of age and was buried at the Lone Fir Cemetery in 1967. The collection consists of manuscripts, documents, photographs, news clippings, press releases, correspondence, publications, and biographical data pertaining to the personal and professional life of Esther Pohl Lovejoy.